I am often asked, why do you place yourself in a group, and box yourself in when you should assimilate into America. The answer is twofold. First, because of government categorization, Latinos have to select a box that gives us a sense of togetherness. Second, there are some extreme groups who often target Latinos with hate or negative stereotypes that fulfills their racist drive. So I place myself in a Latino group as a coping mechanism of “togetherness,” and to protect myself and others like me, against all extremists like Ann Coulter who constantly remind me that I am different and say that I am not welcomed in the melting pot of America. As soon as the 2012 Presidential election ended, the race of blame began. Many sought to blame the Republican loss at someone, and last week some of those (who have dominated the Republican Party for too long) boasted their designated mouthpiece, to start the battle with other Republicans and Immigrants, specifically Latinos. In a recent article by Ann Coulter, titled “America Nears El Tipping Pointo,” she states (among many things) that Latinos are immoral, lazy, and are going to lower that greatness of America. According to Ann Coulter, the shifting of demographics in America is shrinking the opportunities for whites because Latinos are coming into the U.S. as unskilled workers and have done so since coming into the U.S. since 1968. What Ms. Coulter fails to state in her prejudicial rant is that those unskilled workers were the necessary labor force that was needed in order to build the “greatness” of the U.S. economy, much like the workers who helped to build roads and buildings during the Depression. According to Ms. Coulter’s argument, America has not been “prospering” since the immigration deluge created in 1968, yet this is untrue. Small businesses and the economy boomed during the 1980s and most of the 1990s thanks to the high tech companies coming into the U.S. and created by many Immigrants. As a result, that stimulation caused a boom in the housing market and service industries. Consequently, those industries used many necessary “unskilled” workers namely Latinos to build homes, work in restaurants, and pick the produce in the agriculture industry. Thanks to their work, therefore, families had food to eat and houses in which to live. In a study by Steven Raphael and Eugene Smolensky from the Goldman School of Public Policy at Berkley and published in 2008, Raphael and Smolensky suggest that while immigrants enter with lower skills and a high level of poverty, this is overcome and they surpass the Natives within a few years. In fact, their study showed that in 1970 and 2003, immigrants were a crucial part of the free market that stimulated the U.S. economy. They further showed that foreign born immigrants had a higher education level than white native males from the U.S., 10.84 to 9.45. ages from 18 to 64. The study further shows that, “Recent immigrants from Latin America and Asia tend to experience high initial poverty rates which certainly increased the overall poverty rate relative to what it would otherwise be. However, this effect is small (no more than half a percentage point). Moreover, through wage growth and selective out-migration, immigrant poverty declines quickly with time in the U.S.” A similar study by the Dallas Federal Bank showed that Latinos overcome poverty through education and English skills. Coulter’s argument that the poverty is concentrated solely within the Latino community is false and her argument is misleading. The fact is, poverty in America is evenly spread among households of other ethnicities including Black, Hispanic, and Asians and the latter being in smaller numbers. Asians, natives and immigrants have a higher level of education than many of the white (Anglo) population in the U.S., but Coulter fails to admit this fact as well. Because women tend to earn less than men, take more time out of the paid workforce, live longer, accumulate less savings, and receive smaller pensions, Social Security is especially important for them. Women constitute 56 percent of Social Security beneficiaries aged 62 and older and 67 percent of beneficiaries aged 85 and older. Women pay 41 percent of Social Security payroll taxes but receive nearly half of Social Security benefits. This is because women benefit disproportionately from the program’s inflation-protected benefits (because women tend to live longer), its progressive formula for computing benefits (because they tend to have lower earnings), and its benefits for non-working spouses and survivors. Therefore, Ms. Coulter should be chastising women of all color for living longer and leeching off the entitlement program, but she does not. She only points to the Immigrants, and better yet Latinos as being the ones taking from the system. In addition, the current debate about the fiscal cliff has brought to light that, in fact, those predominantly “Lilly white” states use more government programs than any states with large Latino, native or immigrants, population. Ms. Coulter further states that Latino women are having children without spouses or a marital commitment. Shame on them Ms. Coulter, for choosing to give life rather than abort them as others would urge, like Planned Parenthood and other organizations that urge Blacks and Latinos to abort their pregnancies. Further, rather than end a life Latinas choose to have their babies even if they have to raise them is a single parent home, but that is part of the conservative thought among Latinos, life first. In fact, according to the Guttmacher Institute, Latinas have abortions in lower amounts than “white” women, “Non-Hispanic white women account for 36% of abortions, non-Hispanic black women for 30%, Hispanic women for 25% and women of other races for 9%.” Coulter’s argument is counter to the Conservative argument of Pro-life. According to Ms. Coulter’s argument, having children without a spouse is immoral. She would rather the children not be born at all, thereby lifting the immoral stigma off of single mother Latinas. Interesting. As President Reagan stated in his famous invite to Latinos into the GOP, “Latinos are Republican, they just don’t know it,” Ms. Coulter says otherwise and further declares that the GOP does not need “government dependents” in the Republican Party. That's a lot of government dependents coming down the pike. No amount of "reaching out" to the Hispanic community, effective "messaging" or Reagan's "optimism" is going to turn Mexico's underclass into Republicans. Notwithstanding the fact that all demographic and economic research shows that Latinos quickly assimilate and move into middle-class status by the next generations, Ms. Coulter wants conservatives to thinks that all Latinos are newly arrived peasants from Mexico, or an “under-class” as she wrote. Evidently, she is more concerned with espousing old myths, citing statistics from the 1960’s and 80’s, to make her argument about Latinos just the same way that nativists used do about Irish, Italian, Jews and eastern Europeans to rally the base. She does this because she knows, and fears, that the rising of a strong Latino movement within the GOP will put an end to her, and others like her, who have made a career out of espousing hate, but hold some leverage within the conservative movement. 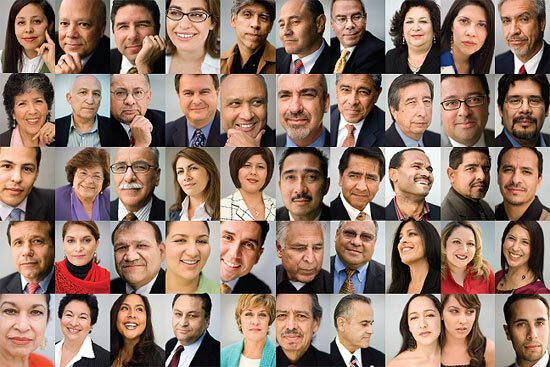 There is no reason to believe that Latinos are different than any other group. Yet those like Coulter want to portray Latinos as a naturally different group of un-assimilated “government takers,” however, they do not use plausible data to support such an argument. In fact, she and her ‘group” want to show that Latinos are not worthy to belong to the Republican Party or America for that matter. 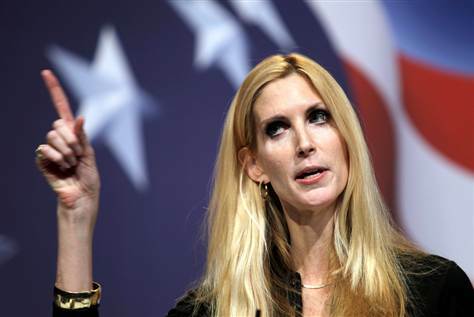 Coulter’s sour rhetoric continues to undermine the recent outreach that many Republicans like Sen. Marco Rubio, Gov. Jeb Bush, President Bush, and others who are currently working within the Latino community so as to stimulate the low numbers in the shrinking Republican party. While Coulter and her “immigrant haters” shout false data, it is baffling on how the party will entice new members from groups such as the young, Latinos, and Asians. The Republican party is declining in numbers while the door remains shut because of Coulter and others who display this type of behavior. History would show us otherwise about the Republican Party and their outreach to diverse groups. In fact, the Republican party has always been the one to embrace these groups, who are continuously attacked on their “credentials,” and has been instrumental in offering them freedom from servitude while creating opportunities through inclusion in this wonderful country called America.